Dec. 6th: Venezuela – What is really going on? 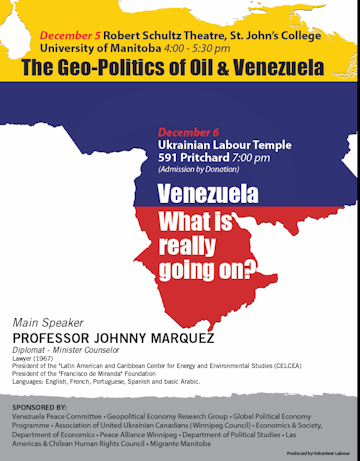 The main speaker at each event is Professor Johnny Marquez, a Venezuelan lawyer, diplomat and scholar and president of the Latin American and Caribbean Center for Energy and Environment Studies. Please help promote these events by sharing this article or circulating the poster, which you can download here.